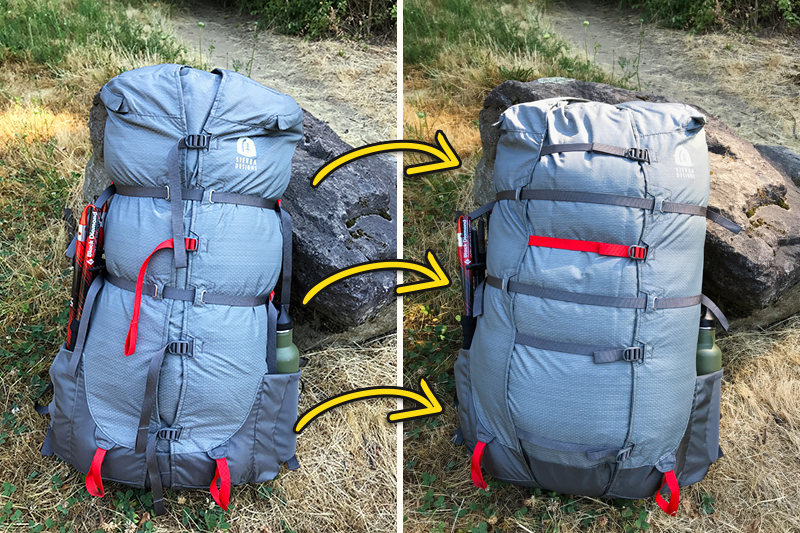 It was almost a year ago that I got my first look at Sierra Designs’ new ultralight backpack, the Flex Capacitor. Being a pop culture geek, the play on the name elicited a little giggle. (For those of you blinking confusedly, it’s a reference to the flux capacitor used in the DeLorean time machine in the movie Back to the Future.) Designed by National Geographic 2007 Adventurer of the Year Andrew Skurka, this lightweight pack derives its name from more than a catchy movie homage, but for its ability to expand (i.e., flex) from 40 liters to 60 liters, and for the shape of the internal support element designed in a very flux capacitor-like shape. was the first thing I noticed—just 2.7 pounds! Get quick access to your essentials with the Flex Capacitor’s easy-zip lid. Earlier this spring, I finally got my hands on a sample of the Flex Capacitor. Of course, the pack’s exceptional light weight was the first thing I noticed—just 2.7 pounds (size M/L). This is more than 2 pounds lighter than my favorite 65L pack! Next I combed over the pack’s construction and various features. On the outside, it sports six pockets: two large hip belt pockets, two mesh side pockets, a zippered lid pocket and a stretchy shoulder strap pocket. Nice—I love pockets! There’s also an innovative compression strap system and gear loops. On the inside, there is a removable hydration bladder sleeve. The body materials are durable 100D and 420D ripstop nylon/poly, and the harness consists of a nicely-padded hip belt and large, cushioned lumbar and scapula pads. So far, so good. But there has to be sacrifices to get down to this light weight, right? This is where I took a closer look at the ultralight DAC Y-FLEX suspension bar. This appeared to give the pack a decent amount of stability. We would put that to the test. Then it occurred to me (something I missed on my first inspection) there’s only one way into this pack—through the fixed, zippered lid. Ah-ha! There’s no panel entry, no lower sleeping bag compartment, not even a cinch top. This is where they certainly economized by reducing the number of zippers and amount of material used. Admittedly, this is where the über-organizer in me cringed a little. Okay, let’s give it a run. hand sanitizer, a couple snacks—within easy reach. 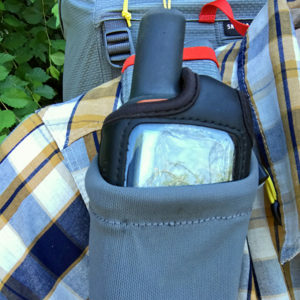 Stash a water bottle, snacks or your GPS in this handy shoulder strap pocket. I loaded up my Flex Capacitor with a 25-pound load and hit the trail. At this weight, I was able to keep it in its minimal, 40-liter configuration. I was immediately impressed with the pack’s load management. The combination of the large lumbar pad and padded hip belt were very comfortable and supported my load nicely. The large scapula pads cushioned the backs of my shoulders, and the large open space between those and the lumbar pad allowed for nice airflow. Up and down hills, rock-hopping and crawling over logs, the pack felt stable and secure. Back to all those pockets, I liked being able to keep several essentials—phone, headlamp, hand sanitizer, a couple snacks—within easy reach in the hip belt pockets; the right-side shoulder strap pocket was perfect for holding my GPS. It can also hold a small water bottle or make a good place to stash sunglasses or extra energy snacks. And the side pockets were in easy-enough reach to fetch my water bottle or trekking poles without dislocating a shoulder. Next was to open it up to its 60-liter full size and really stuff it. With a larger, 35-pound load (including a full-size bear canister) it was a little more challenging to load proportionally through the single top-entry, but fully loaded it kept its structure and integrity. The outward-expandable design is what maintains this, by keeping the load centered and supported on the back instead of expanding it upward into a floppy, unsupported collar. Nice! Back on the trail, the larger, heavier load was inconsequential in maintaining the pack’s comfort and stability. The Flex Capacitor can expand from 40L to 60L to accommodate trips from short and light to long and loaded. PROS: First and foremost, the Flex Capacitor’s light weight is a huge advantage to cutting base weight. It has exceptional versatility for accommodating both smaller-load outings and larger-load treks in a single pack. The number, size and placement of external pockets is great for keeping essentials accessible while on the go. The extra-cushy back panel pads keep the pack load comfortable while still allowing plenty of cooling airflow. 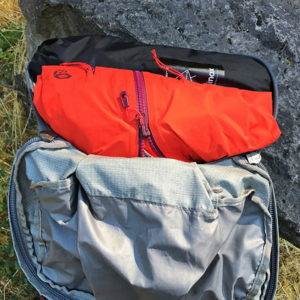 CONS: The top-load-only access point may frustrate gear organizers, and the fixed lid is not usable as a summit bag, or as an in-tent bag for extra apparel and essentials. With the absence of lower compression straps, the only way to attach a sleeping pad on the outside is with the lateral compression straps—something that is quite challenging when the pack is fully expanded and stuffed. Unfortunately, there is no rain cover. and it’s one I look forward to putting many more PCT miles on. Whether you’re a weekend backpacker or a long-distance trekker, I can certainly recommend the Flex Capacitor as a solid choice of backpack. Between its light weight, versatility and exceptional stability—despite the few drawbacks—it proved to be quite comfortable. In an updated model, my improvements of choice would be a removable lid and slightly longer compression straps for lashing a sleeping pad on the back when fully expanded—but neither of these wants are deal-breakers. Overall, I really enjoyed hiking with this pack, and it’s one I look forward to putting many more PCT miles on. This review is based on the personal experiences of guidebook author Eli Boschetto. This product was tested in a variety of weather, temperature and trail conditions. Individual results may vary. For more information on PCT: Oregon gear reviews, click here. This post contains affiliate links. All purchases made through affiliate links help support the costs and operations of PCT: Oregon. 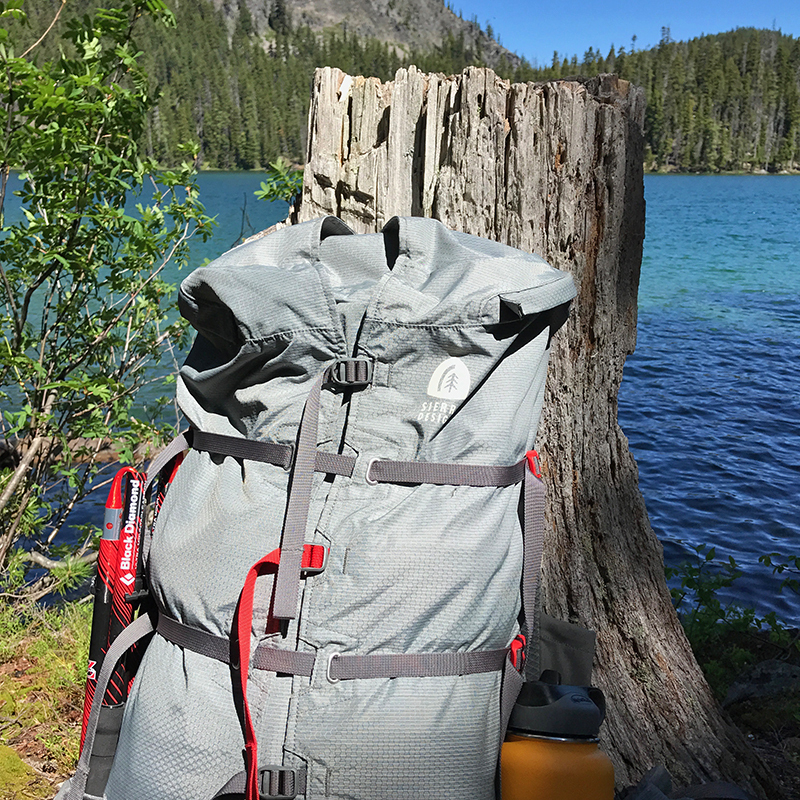 Main photo: The Sierra Designs Flex Capacitor backpack on the PCT at Lower Rosary Lake. Photo by Eli Boschetto.